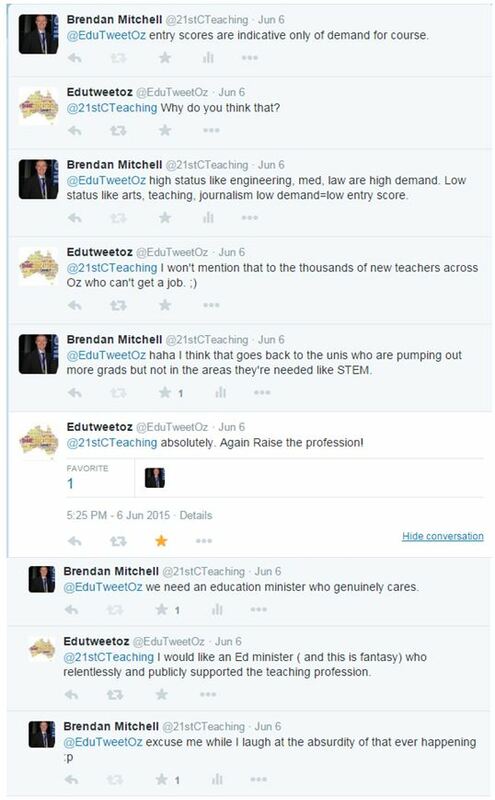 The @EduTweetOz Twitter account describes itself as “RoCur for Aussie educators to share ideas, experiences, q’s & passion. Building community. New host each wk” and is a very worthwhile Twitter account to follow. Each host brings with them a new topic and their own perspective on that topic to the table for discussion, and each host is also given an introductory interview blog on the EduTweetOz blog site which allows the accounts followers to gain an insight into the week’s host. There are a few thoughts that arose from this conversation which I believe are important to discuss and if I provoke some constructive dialogue, whether it be in comments to this article here on WordPress, or alternatively, on Twitter or Google+, I believe that I will be happy. There were six main ideas or topics that I drew from the conversation with Mark, and this article will address the first of them, with others emerging over the course of the next week. I certainly do not believe that I hold the answers to any of these issues, though I certainly have some opinion, however rigorous discussion around some of these issues appears to be sparse in their occurrence, despite the level of importance to which society as a rule attaches to education. The above issues are all, to a certain degree, inter-related, so their may be some topic-jumping, however I will do my best to keep this series of articles on topic. Raising Uni Entrance scores to improve teaching? Myth according to me. Students with high scores free to go into teaching now. Raising Uni Entrance scores to improve teaching? Cut out the low entries? They might become some of our most inspiring teachers? I do not disagree with the premise, that increasing the entry score for ITE courses will necessarily equate to a raising in teacher standards. I strongly believe that there are too many variables in play, as with any sort of standardised testing regime for the overall mark awarded at the end of a students secondary education when they are either seventeen or eighteen to be any indication of the kind of teacher they will be later in life. I pointed out that as a secondary student, I performed poorly in my final secondary education exams, receiving a University Admission Index (UAI, currently known as the ATAR (Australian Tertiary Admission Rank) in NSW) score of only 55.55. Posted on June 12, 2015 June 12, 2015 by Brendan MitchellPosted in Education, Initial Teacher EducationTagged career change, education, Initial Teacher Education, ITE, new teachers, Pre-Service Teachers, PST, teaching, University. Hi Brendan, this is a great piece – yours is a very relevant and worthwhile perspective to this discussion. I’m interested in your suggestion that people considering teaching shadow a teacher for some time before making that decision. When I did my 4 year primary education degree, my university sent us into schools for a month’s practicum 4 weeks after commencing our first year. We continued to do 4 week practicums every semester until our final year where we did an internship. I remember several students dropping out after their first and second pracs. For many it wasn’t that they didn’t measure up, it was that they discovered they didn’t like the environment or the real nature of the work. Since then, for a range of reasons, universities seem to have cut back on the amount of practical experience their students have throughout their degree. My school takes in students in their 3rd year of an education degree but are on their very first prac. By that stage, they’ve invested so much in their degree, that its much harder for them to decide its not for them. The HECS debt also creates a disincentive to change courses. Back when I was at uni, HECS was only a small amount, so the stakes were not as high. If there were a way to make it work, however, I’d like to see preservice teachers having more practical experience throughout their degree, to help them have a practical as well as theoretical understanding of the work of teachers and to decide early on if its the right career for them. Hi Brendan – thanks for a well-articulated post. On a more general note – I second what Corinne has said. It is apparent, both from self-reflection, and my last practicum report that my classroom practice needs considerable work. That practice will not improve in the slightest by virtue of an ongoing high GPA. It is unfortunate that I will graduate from my two-year B.Ed. (graduate entry) degree with a mere 60 days of practicum placement (3 blocks of 20 days). That said, I have approached my daughters’ local primary school and both practicum schools to ask (plead) for further in-class experience as a volunteer. Whilst I received plenty of “yes, that’s a great idea” responses, not one school has followed through on the request. 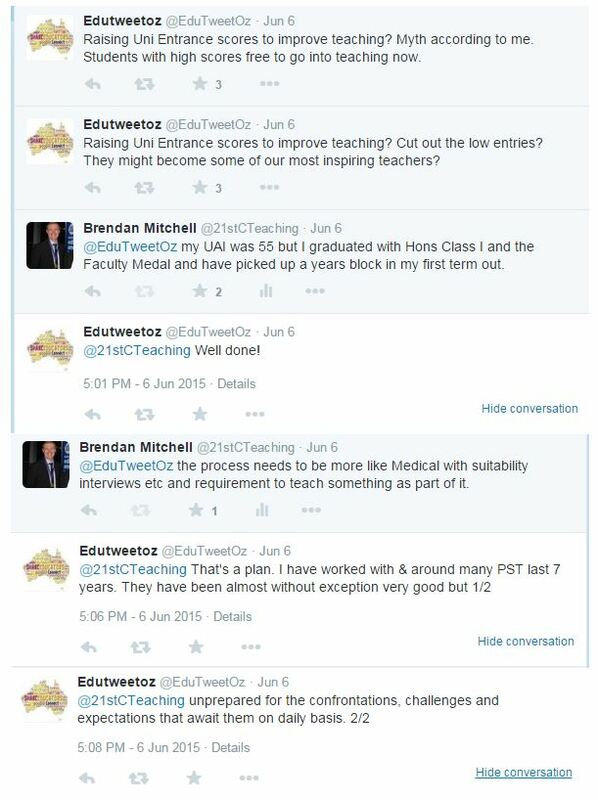 As a result, I am left to wonder how PSTs and ECTS are supposed to improve their practice? I should also mention here that a local SSP were happy to take up my offer of volunteering, too, although that experience did little to further my growth as a PST in a regular classroom setting. I am fortunate that I have run a Cub Scout pack for a few years, and have other “teaching opportunities” made available through non-classroom teaching experiences offered by the University. As a parent (to four) and as someone who has worked in a school in various capacities (from Kitchen Manager to Aide), I am also fortunate enough to have a reasonable understanding of the 24/7 nature of the profession. I am not sure how I might have managed as a student straight out of high school. Thank you for replying. It is interesting to hear the different ways that ITE is structured at different institutions and whether it is an undergraduate or post-graduate program. I plan to address that topic in my next article, due on Monday. Thank you for the comment. You raise some valid concerns regarding around sunk cost fallacy, which I plan to address in my next article.